Merry Christmas, or Happy Hanukah or Seasons Greetings, take your pick. Personally I celebrate Christmas, so that’s always my first thought this time of year. Well, I still have December’s monthly block quilt to create, but I do have it planned out. I didn’t bring it with me, so that will have to come together when I get back to my sewing machine! But when I finally finished my customer quilts with a Christmas due date, I had a bit of time to do something FUN. My friend at the quilt shop the weekend before had shown me a photo of a fruit pie potholder she was going to make for some gifts (sorry, I’m sharing this a little late for that, probably). I immediately fell in love with the idea and had to take it on as well. I bought the rick rack and berry fabric and when I had that bit of time I went to it. 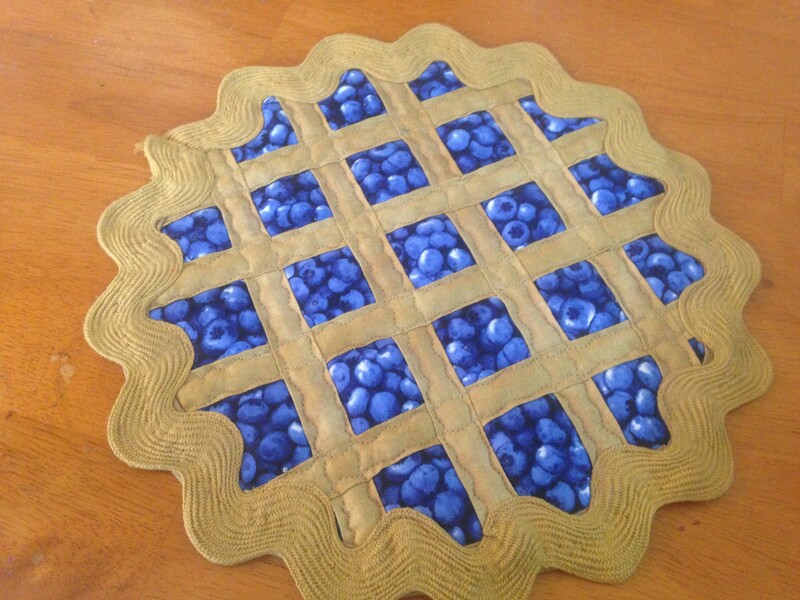 The photo shared with me had a pie tin (silver fabric) along the outside, creating a circle edge. I didn’t love the look of that, so I did it my own way. I took a pie tin and cut out a circle of the berry fabric and cut a 9″ square of batting and Insulbright. I used a scrap piece of tan fabric for the back that was large enough to put up on my long arm machine (because that’s how I roll yo). I had these scraps of marble fabric in a gold color, which matched the rick rack (too light and the pie would have looked unbaked). I trimmed them to as large as I could, and sewed them wrong sides together to make a long tube. I ironed the seam open so it was on the bottom side and then cut the tube and made lattice on the top of the pie. I then wove the lattice and set it in positions I thought it looked tasty. And then I pinned it. I hate pinning. I put it on the long arm and did a little wavy line within each piece of crust on the lattice on each side of the lattice to keep it down. Then I trimmed my pie and (ugh) pinned again so the binding was folded over from back to front, twice so the raw edge was hidden completely. Sewed that down. Then I had to pin (GRRRRRR) the rick rack on top and I zig zag stitched that down, and then straight stitched the inner edge of it down too. I stitched over the raw edge of it where the rick rack came together and BOOM done. 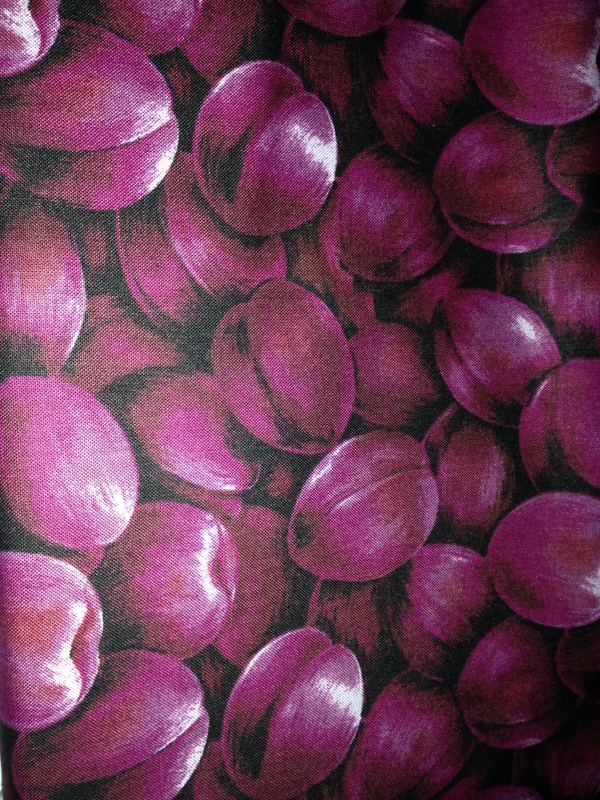 I’m so addicted to this cuteness that I bought THREE yards of this plum fabric to make more! I can get my hands on cranberries, raspberries and I found mixed berry fabric online. It’s harder than you’d think to find fruit fabric without stems, peels or background print! I’ll be making more of these for some craft shows and you will DEFINITELY see them in my Etsy store sometime soon!